Can It! These beans are the best. Bridget used to be known for her homemade red beans and rice. This is New Orleans, and every Monday we citizens clamor for a nice steamy bowl of the good stuff. 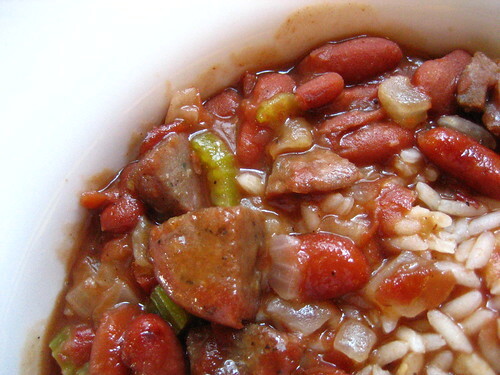 Today’s not Monday, but we were really craving red beans, so here we are. About a year ago we discovered Blue Runner Red Beans. Sorry Bridget, you just got served. Yes, these beans are in a can, but after a little Blake Magic, they certainly don’t taste like they do. I cube some turkey sausage and brown it in my enamel stock pot. When it’s browned, remove it from the pan. Chop an onion and 2 stalks of celery and cook it in the pot with the sausage bits in the bottom. When the onions are see-through, add 1/2 cup hot chicken stock, scrape the bottom and reduce for a few minutes. Add 2 large cans of the canned red beans. I season them with Kosher salt and some Tony’s. 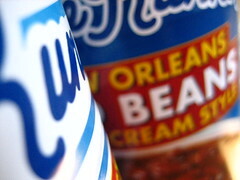 It may be a carnal sin to enjoy canned beans as much as homemade, but believe me, you’ll never know the difference.